NETWORK FINALS: WORLD SERIES Game 2 had a smaller adjustment in finals than Game 1, up 0.3 to 4.2, which left it down 0.6 from 2016’s Game 2. Elsewhere, DESIGNATED SURVIVOR fell 0.1 to a new low 0.7, and THE BLACKLIST also lost 0.1. CABLE HIGHLIGHTS: More sports led Wednesday cable, with ESPN’s NBA doubleheader at 0.99 (Washington vs. Lakers) and 0.63 (San Antonio vs. Miami). On Comedy Central, SOUTH PARK jumped 0.15 to 0.69, and BROAD CITY was up 0.06 to 0.34. VH1’s BLACK INK CREW slipped 0.02 to 0.51. Bravo’s REAL HOUSEWIVES OF NEW JERSEY lost 0.03 to 0.43. Fox News’s HANNITY led cable news at 0.37/0.62/3.6M, over MSNBC’s RACHEL MADDOW SHOW at 0.29/0.43/2.4M and CNN’s SITUATION ROOM at 0.21/0.25/900K. TBS’s FULL FRONTAL returned at 0.36. On Discovery, GARAGE REHAB dropped 0.04 to 0.35, and MISFIT GARAGE was down 0.04 to 0.32. OWN’s QUEEN SUGAR rose 0.05 to 0.35. On MTV, ARE YOU THE ONE had a 0.13 jump to 0.34, and a lead-in TEEN MOM episode ticked down to 0.21. On ID, HOMICIDE HUNTER fell 0.06 to 0.32, and UNUSUAL SUSPECTS was down 0.06 to 0.21. 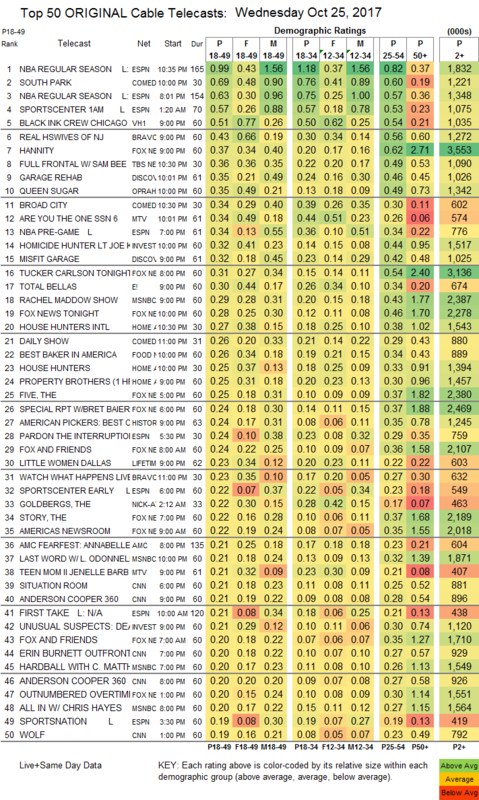 On E!, TOTAL BELLAS edged up 0.02 to 0.30, and ERIC & JESSIE was steady at 0.13. HGTV’s HOUSE HUNTERS INTL gained 0.02 to 0.27, HOUSE HUNTERS dipped 0.02 to 0.25, and PROPERTY BROTHERS was down 0.04 to 0.25. Food Network’s BEST BAKER IN AMERICA climbed 0.03 to 0.26. On Lifetime, LITTLE WOMEN DALLAS rose 0.03 to 0.23. USA’s MR ROBOT continued downward, falling 0.05 to 0.18. Syfy’s CHANNEL ZERO dropped 0.03 to 0.11. On BET, FACE VALUE fell 0.05 to 0.09, and 50 CENTRAL was down 0.06 to 0.08. Spike’s SHANNARA CHRONICLES ticked down to 0.09. 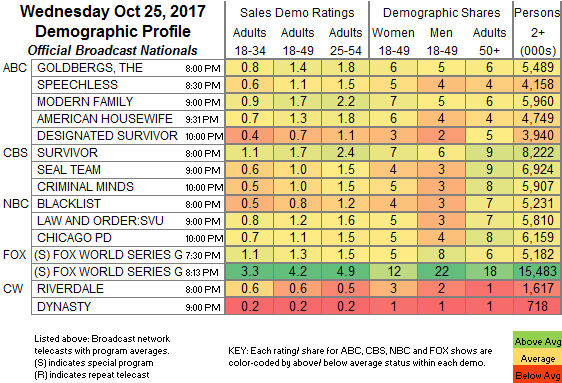 FXX’s YOU’RE THE WORST took an ugly 0.08 hit to 0.06. Off the chart, IFC’s BARONESS VON SKETCH SHOW slumped by 0.04 to 0.02/86K, and Sundance’s LIAR stayed at 0.01/97K.